Amazon.in introduces you to new budget laptop model Nexian Chromebook CB-116 11.6 inch laptop. It is pretty grand new to the market and customers. It is pretty comfortable for rough & tough use and available at affordable price. You can grab it for launch offer price of INR 12,499/- only at Amazon.in. Still Amazon.in loves you with offering EMI facility as well as cash on delivery. Hurry up. Explore down for more details. Jaipur: Amazon.in understands you more than any one. Yes. It is the best friend of all Indians. It takes care of all our needs in our budget. Now it came up with very affordable laptop model new Nexian Chromebook. Nexian Chromebook is a very comfortable laptop and you can carry it wherever you go. As simple to use as simple to operate and carry. It is specially and purposefully designed to do things effortlessly. It has 4200 mAh battery which powers up laptop up to 8 hours. With one full charging, you can work whole day happily. You can have all the fun with it. It has got many offline and online Chrome apps. Nexian Chrome book sports 1.8 GHz quad core processor coupled with 2 GB RAM and ARM Mali-T764 graphics. It has got bundle of built in apps for your convenience. You can put it on track in less than 10 seconds without any delay. Very quick start mode, faster and effective performance. It keeps you auto updated. 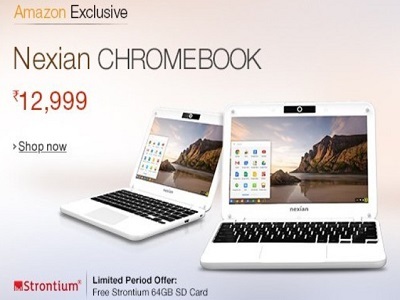 Amazon.in offers you additional benefits with the purchase of Nexian Chromebook. You will get 100 GB cloud storage (Google Drive) for 2 years. More over it is available in Laptop buyback offer through which you can buy it at ease by exchanging your old laptop. This entry was posted in Price Drop, Tech on July 10, 2015 by Kalyani.